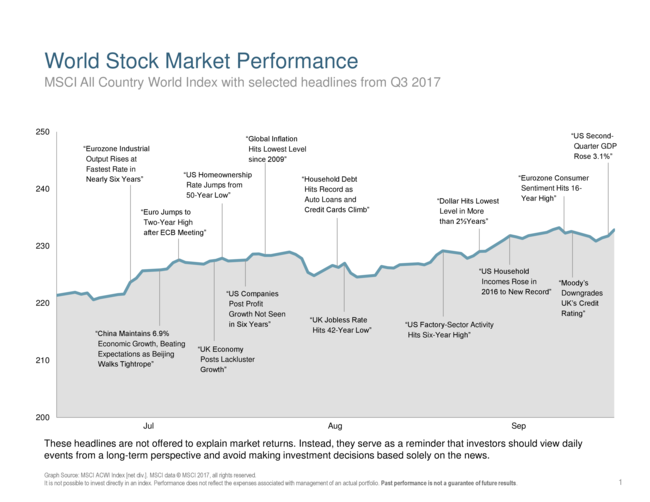 During the third quarter, global markets continued their upward trend, with solid earnings and economic data supporting the increase. Disruptive hurricanes, belligerent dialogue between North Korea and the U.S., and violence in Charlottesville, Virginia barely gave equity markets pause. The S&P 500 rose 4% to a new record during Q3, its eighth consecutive advance. International and emerging equity markets grew even more robustly with Europe, Asia Pacific and China advancing. During September, the European Commission reported that businesses and households across the eurozone were more upbeat about their prospects than at any time in more than a decade. Globally, all 45 countries tracked by the Organization for Economic Cooperation and Development (OECD) are set to grow this year, a synchronization uncommon over the past 50 years. 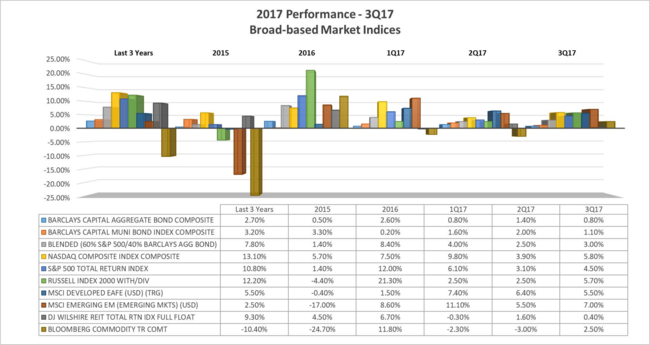 As we mentioned last quarter many experts feel the market is adequately to optimistically priced, but not “exuberantly” so. Moving into the earning season analysts are predicting another great set of profit figures. The consensus forecast calls for 5.5% year-over-year growth for S&P 500 companies. Most agree the risk of recession globally is low at this point. Time will tell whether markets have correctly anticipated actual growth numbers, or if they need adjustment. A growing concern echoed by many financial professionals is the lack of any meaningful pullbacks, before continued increases, that we have experienced over the last couple of years. Not that we object to increases, however traditionally, it is considered normal and healthy to see 5 – 15% declines within an equity bull market. Many theories exist as to why volatility has disappeared from this current global rally, which include: artificially low interest rates, lack of strong inflation, and insatiable demand for income due to increasingly older populations in developed economies. Whatever the cause, we like others warn that relentless advancement is rare, and remind clients that markets can shift quickly. We should expect in the future, a reversion to larger movements in daily prices, that are customary to typical market cycles. Global fixed income markets increased slightly during the quarter, despite continued signs that world banks will continue to shrink rather than grow their respective stimulus plans. In the U.S., the benchmark fed funds rate was increased in June for the second time this year to a range between 1% and 1.25%. Investors expect the Fed to raise the benchmark rate .25% again at its final meeting for the year in mid-December. Also, in September as expected, the Fed announced the start of what’s being termed as the Great Unwind, or the reversal of its $4.2 trillion portfolio of U.S. Treasury debt and mortgage-backed securities purchased after the 2008 crisis. The Fed plans to reduce bond holdings by $10 billion a month for the first three months, raising the pace by 10 billion every three months thereafter. U.S. bond markets took the news in stride, and rates moved up gradually in anticipation, with the 2-year Treasury close to 1.5% and the 10-year Treasury close to 2.3%, an increase from 1.28% and 2.14% respectively. For the past 10 years, fixed income markets have reacted nervously to the thought of reversing easy money conditions, but for now they have accepted the plan as manageable. Alternative Income investments, which include oil & gas pipelines, and commodities were mixed for Q3. Crude oil process rallied on the back of stronger demand forecasts and talk that OPEC could extend its production deal. In general, commodities prices increased, except for gold, which reacted negatively to hints by the Federal Reserve of a third interest rate increase for the year. Looking ahead, there is much anticipation regarding: the announcement of the next Federal Reserve Chief, continued unwinding of Fed’s balance sheet, tax reform legislation, unanticipated inflationary trends, geopolitical events including North Korean sanctions, renegotiation of trade deals, and continuation of the Iran Nuclear agreement. We continue to monitor market reactions, and are always available to discuss how these developments pertain to you and your family’s plan.